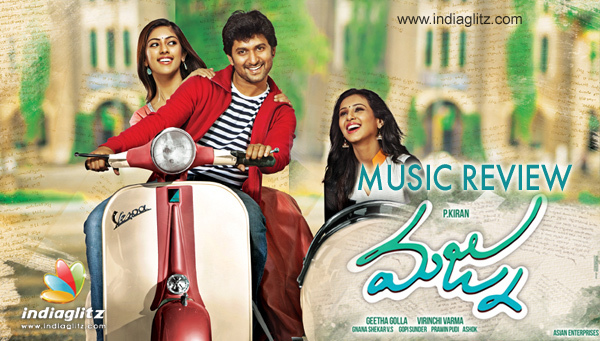 Music-directed by Gopi Sunder, 'Majnu' is for those who put lyrics before everything. All the songs are by Srimani, barring one song each by Ramajogayya Sastry and Rambabu Gosala. Suchit Suresan, Haricharan, Rahul Nambiar, Naresh Iyer, Ranjith and Chinmayi are the singers. The sound of Gopi Sunder is back. After a soothing album like 'Oopiri', he is in the reckoning for good. The lyrics of 'Kallumoosi' meet their musicalequivalent here. Although the temperament of 'Seethamalakshmi' from 'Seethamma Andalu Ramayya Sitralu' is evident, the song has an identity of its own. The nuances are enjoyable. Srimani's lyrics mirror the admiration of the lover boy in good proportion. Lines like 'Entha mounam olikesaave, antha telisave' ('The more you betray silence, the more you reveal yourself') and 'Dorikindile, nee donga navvuku ardhamemito' ('I just discovered the meaning of your clandestine smile') take the cake. Suchi Suresan's excellent rendition reminds one of Nani's previous tryst with Gopi Sunder: 'Mottamodatisari' rendered by Sachin Warrier. This climactic song is mildly inspired by the tune of AR Rahman's 'Edho Edho Naalo' from 'Nee Manasu Naku Telusu'. Haricharan's vocals bring out the pathos of the lover boy, who wails that the other one is feigning aversion for him. The rhymes and alliterations don't seem force-fit and ably complement the theme of Ramajogayya Sastry's lyrics. Rahul Nambiar croons the song to a playful effect. Gopi Sundar's music seeks to mirror the optimism of the lover boy, an optimism the lyrics give out. Srimani draws from metaphors and drafts air, fire, water, and more to drive home the point that the victory is going to belong to the lover. The number is a soothing melody and comes with profound lyrics. Srimani once again deploys his poetic imagination through such lines as these: 'Hayi loya lona thosesinava' and 'Chinni gunde cheyi jarene', among others. The singer takes the number to the next level with his soft vocals. Music-wise, the musician surely deploys Maestro Ilaiyaraja's lessons with aplomb. Chinmayi is at her usual best in a song that is organic to the Nature. Srimani's lyrics come with lines like 'Cheyi patti aapana, titti kotti aapana, parugu pette ee nimishanni' and 'Vellanivvananthaga haddukunnayiga ee theepi gnapakalanni'. After a male-oriented melody, Gopi Sundar here gets an opportunity to melody-fy with a female-oriented one. The song is largely in the mold of hero-and-his-friends-oriented numbers that glorify celebration and rive home the life-is-a-festival philosophy. 'Manala Ambani cheyaledu enjoy' and the like are jaded lyrics that could have been avoided. A mediocre song, Ranjith's electrifying vocals are a takeaway. Verdict: Gopi Sundar's melodious outing largely, it's a romantic album you wouldn't want to miss, especially because of the lyrics.